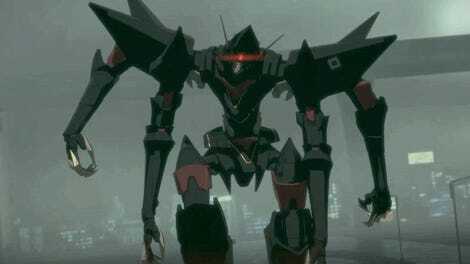 Rooster Teeth’s new animated series gen:LOCK from Gray Haddock is a near-future sci-fi fantasy set in a world where war is waged with hulking, humanoid mechas operated by hotshot pilots. 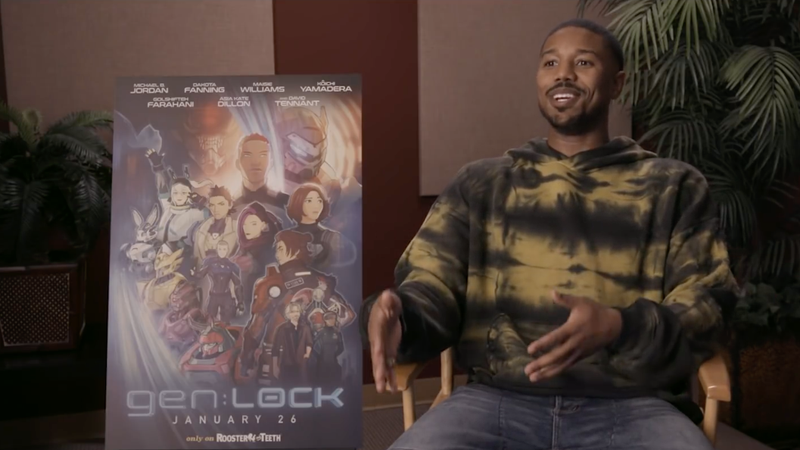 The anime which inspired gen:LOCK are written all over the show, and its hero, Julian Chase (Michael B. Jordan) immediately reads as exactly the kind of character you’d expect to be heading up the fight to save humanity. But when I spoke with Jordan recently, he was adamant that Chase isn’t your prototypical anime hero because gen:LOCK isn’t your traditional anime. It’s very much a Western product and, according to Jordan, he’s the kind of character who perfectly embodies how the series wants to pay homage to the genre that made its existence possible, while also being something unique. 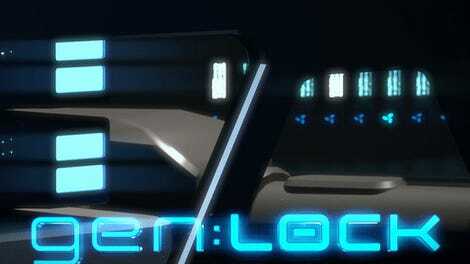 Read on for our interview with Jordan, plus watch the first ten-minutes of gen:LOCK exclusively here on io9 ahead of the series premiere on January 26.
io9: Where do you have to take yourself, mentally, to put yourself into Julian Chase’s shoes and bring him to life? MBJ: I don’t have to go pretty far. To me, Julian’s a very selfless person who wants to do the right thing and would sacrifice himself in order to protect the world and the people he loves. He’s your traditional hero, but at the same time I wanted to make him feel real, and so I spent a lot of time trying to figure out how someone like him with all this weight and pressure on him would respond naturally to the things happening in his life—good and bad. io9: You’ve done some voiceover work in the past, but what was it about gen:LOCK that drew you to the project aside from your love of animation? MBJ: Well yeah, you never have to worry about over-acting or delivering these crazy performances with your face being all screwed up, and they’ve got you looking crazy. With this, I really had to let go and let Julian out, and it ended up being a really refreshing experience, honestly. io9: Do you think with gen:LOCK being animated, you’re able to bring something to your performance as Julian we wouldn’t necessarily see from the kinds of live-action characters you play? MBJ: Ha. In a nutshell, you get some charm and charisma every once in a while, but you get less anger, I think. There’s way less seriousness when it comes to Julian. He’s looser than a lot of the characters I tend to play, so to speak, and so he’s always trying to make light of the situation instead of feeling sorry for himself, and that’s one of the things that makes him so fun to play. io9: What are some of the more traditional anime themes that are really being centered in gen:LOCK and how is the series tackling them in a way that sets it apart from other mech dramas? MBJ: Because this isn’t your traditional anime show, Julian isn’t like a Goku or a Naruto who’s just going to try his best to punch his way out of problems. gen:LOCK’s a lot more in the spirit of a Top Gun—the heroes are all fighter pilots that have a little bit of moxy to them, but they’re military soldiers, and you can see that reflected in their personalities. They’ve got a different way about handling business about them. io9: We’re about 50 or 60 years into mecha anime’s existence as a genre—what do you think it is about these stories in particular that’s kept them appealing to audiences after all this time? MBJ: It’s that classic story about two sides fighting for what they believe in. Stories about oppressed people rebelling against their tormentors speak to people because we’ve all dealt with that at some point in our lives. We like seeing these stories told over and over again because you can always try to see things from opposing characters’ perspectives and come out sympathizing with them, and so we just want to keep trying I think, to see all of those various perspectives. io9: And for you, personally, what is it about something like Naruto and Dragon Ball that’s kept you coming back to it after all these years? MBJ: When you get down to it, it’s really about having that childhood connection to it, you know? That’s really it. You grow up meeting Naruto and then getting to know him and the world he exists in and you just kinda get lost in the narrative of it all. All of those moments that are about the power of friendship and the importance of sticking to your word—that stuff sticks with you because they’re messages you carry with you as you become an adult and realize that they’re the kinds of things you want to see in the world.